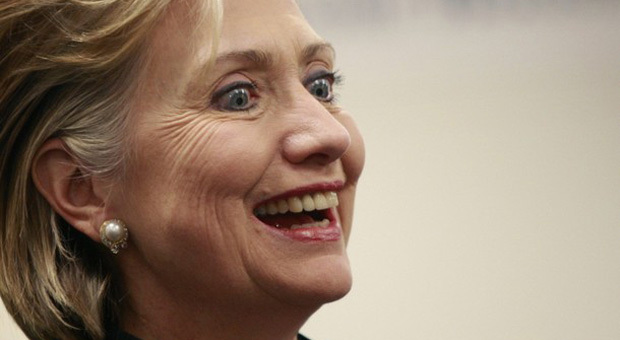 Following a study by scientists at Oxford University, researchers have concluded that Hillary Clinton exhibits traits of extreme Machiavellian Egocentricity and can be officially classified as a psychopath. Clinton has been famed for her blatant disregard for State Department laws and her cold-hearted “we came, we saw, he died” response to the death of Libyan leader Colonel Gaddafi, but it seems that these are actually traits that give away her true mental state. The study rated her for the psychopathic traits of fearless dominance, self-centered impulsivity, and coldheartedness, and then compared her results to those of other historical figures. When her score was added up and compared to other notorious psychopaths, Clinton was placed above Emperor Nero, who famously killed his own mother, and only a few points behind infamous Nazi leader Adolf Hitler. She was also ranked on par with Napoleon Bonaparte, who is known for his ruthlessness and policies which were directly responsible for millions of deaths. According to the Daily Mail, Oxford University’s Dr, Kevin Dutton has been exploring the psychopathic traits of Hillary Clinton and other historical figures using a standard psychometric tool, the Psychopathic Personality Inventory – Revised (PPI-R), reports Scientific American Mind. While learning about these traits, Dutton also looked at which ones can be beneficial and which will lead to destruction.He explains that being a psychopath is not an all-or-nothing affair, but is on a spectrum along which each of us has our place. There also seems to be a range of positions that attract individuals on the high end of the psychopathic scale such as business, surgery, the law military and of course, politics. Previous to this recent study, Dutton contacted the official biographers of many historical leads and asked them to fill out an abbreviated version of the PPI-R in order to create a table showing which traits these figures had.The table shows each subject’s scores for psychopathy’s eight component traits. The first three being, social influence(SI), fearlessness (F) and stress immunity(STI), which are collectively known as Fearless Dominance traits – these leaders tend to be more successful. However, the next four traits that are known as Self-Centered Impulsivity can be destructive. This group includes Machiavellian Egocentricity (ME), Rebellious Nonconformity (RN), Blame Externalization (BE) and Carefree Nonplanfulness (CN). And the final trait is Coldheartedness (C), which is helpful for making tough decisions such as sending troops off to war. 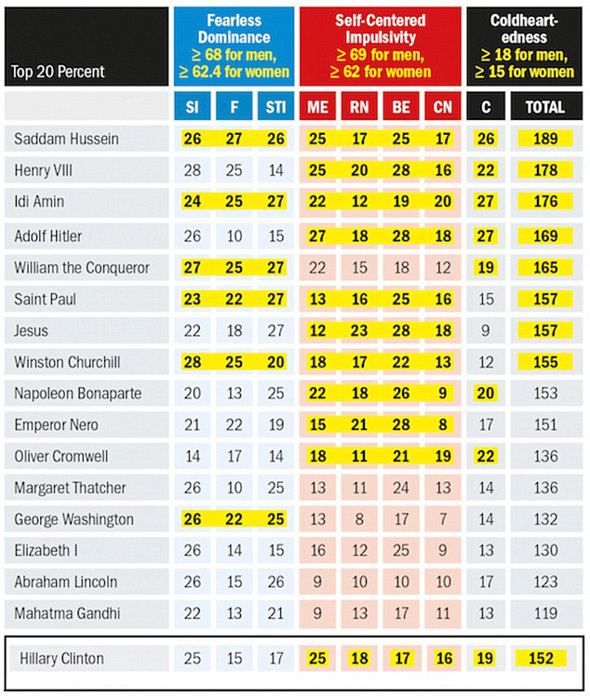 The ‘league table’ implies that a majority of these well-known individuals are high scorers, such as Winston Churchill.